I want people to take what God has blessed them with and use that blessing as a gift to give to others. Within the pages of Mark A. Yeaton’s new book, Elephant on the Menu - A Cycling Venture Across America, ($19.99, paperback, 9781498470773) readers will follow the journey Mark took pedaling across America during the summer of 2012, the third hottest summer in U.S. history. This story shows how Mark, his wife Sherry and son Kendall, benefitted over 5,000 people for years to come by raising funds to put a clean water well in a Kenyan village. Avid cyclist Mark, along with family, raised funds for the International Disaster Emergency Service (IDES), an Indiana based Christian relief agency. The book chronicles the cross-country trip and will raise awareness that everyone can make a difference in this world to help others. This book is about taking passion, teamwork, and stepping out on faith in an effort to draw attention and support to the need for clean water in Kenya. As a cyclist, Mark A. Yeaton has been involved in all forms of cycling from Evel Knievel wannabe as a kid in the 1970's to racing road bikes in the 1980's, to endurance cycling and commuting in the 1990's to present day. He has been riding bikes for 50 years. As a follower of Jesus Christ, Mark has been involved in mission trips on the local level to trips overseas. He attends a very mission-minded church. He was raised learning the importance of helping others using whatever gifts and abilities given by God. Xulon Press, a division of Salem Media Group, is the world’s largest Christian self-publisher, with more than 15,000 titles published to date. 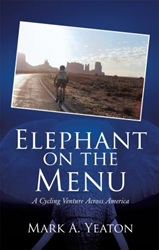 Retailers may order Elephant on the Menu - A Cycling Venture Across America through Ingram Book Company and/or Spring Arbor Book Distributors. The book is available online through xulonpress.com/bookstore, amazon.com, and barnesandnoble.com.